Ironically, my friend, an orthodox Christian though not of the evangelical type, frowns somewhat on Tebowing, while I, the non-orthodox person, favor it. In fact, Tebow has more or less renewed my interest in football, at least in watching games he plays in. I had for the most part lost interest in football because of end-zone dances and all the other flamboyance, showboating, and buffoonery, whatever name one wants to give to it. It is a breath of fresh air to see an athlete who is seemingly not self-absorbed and who has values. I can remember the days when athletes celebrated victory with a smile and an appreciative nod or with a tip of the cap. Sandy Koufax, Floyd Patterson, and Joe Louis come to mind as athletes who knew how to win with modesty. The change toward bombastic celebrations of victory began with Muhammad Ali and the emergence of television during the 1960s. Before then, there were very few ostentatious displays of ego. As a sports fan since the 1940s, I can recall no surly displays of emotion, no menacing gestures, no pumping of the arm and fist, no pounding of the chest, no cupping of the ears and beckoning to the crowd for more applause, no punching the sky with a snarl on the person’s face, no shaking of the fist at the crowd, no idiotic end zone dances, no diatribe, before the 1960s. Apparently assuming that the viewing audience had the mindset of professional wrestling fans, the media bought into Ali’s buffoonery, thereby encouraging younger athletes to emulate him. As I see it, Tebowing is the antithesis of Ali’s buffoonery. It is an egoless display of thanks rather than an arrogant or pompous display of one’s “self-made” physical skills. Of course, there are those, like my friend, who feel that Tebow is overdoing it. They site a Bible passage in which Jesus says to beware of practicing piety before men and to not be like the Pharisees who pray openly on street corners. (Matthew 6:5-6). I can understand that point of view, and wish for a return of the Kofax and Patterson approach to it all, but, at the same time, if all our youth see on television is the self-absorbed buffoonery, what is going to inspire them to act otherwise than public displays of humility as in Tebowing? My friend did say that he otherwise admires Tebow as a person and that if it were a matter of his daughter marrying Tim Tebow or some guy with tattoos all over his arms and neck while adorned in jewelry it would be no contest. For those who claim that “religion” has no place in sports, why do we have to call it religion? Can’t it simply be called humility rather than religion? If pomposity is allowed on television, why not humility? Recent books and articles have discussed the “top 10 places to see before you die,” and “top 100 things to do before you die.” I’ve been fortunate enough to have seen nine of my top 10 and to have done 99 of my top 100. I’ve cruised the Nile and the Rhine, the Caribbean, the Mexican Rivera, the Alaska inland passage, and even the Sea of Galilee. I’ve kissed the Blarney Stone, searched Loch Ness for Nessie, saw the Brooklyn Dodgers play at Ebbets Field, dined below Niagara Falls, gambled at Monte Carlo, prayed in Westminster Abbey, Notre Dame, and the Vatican, walked the Via Delorosa in Jerusalem, run the New York City Marathon, won the Maui Marathon, taken a mud bath in the Dead Sea, hiked the Grand Canyon, explored the Valley of the Kings, shopped in Hong Kong, Bangkok, and Singapore and peered out from Masada. But I have not yet experienced number one on my lists. .
That would be a visit to Abadiana, Brazil, described as “a scrap of a town in central Brazil.” More specifically, though, it is the Casa de Dom Inácio, a short walk from Abadiana, where John of God is the main attraction. 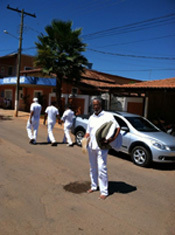 John (Joao in Portuguese) is primarily a healing medium. He allows benevolent highly-evolved spirits to take over his body and perform healing through him. I’ve been told by friends who have visited there that it is the experience of a lifetime. Last month, my friend, Dr. John L. Turner (above), a Hawaii brain surgeon and the author of Medicine, Miracles, & Manifestations, spent two weeks at the Casa, and was very much impressed with what he saw and experienced. In fact, he said that the experience was a hundredfold better than what he expected, and not only because of all the ripe mangoes he feasted on. A foot problem developed five years ago had become so painful that Turner could no longer wear shoes or walk barefooted. He could wear only “flip-flops.” Three different neurologists diagnosed the problem with his feet at “idiopathic small-fiber neuropathy,” for which there was no cure. And this past May, his blood sugar (diabetes) surfaced, requiring oral agents and insulin. While there, Turner underwent “invisible surgery,” in which spirit doctors are said to heal through John of God. Though he felt nothing during the surgery, he was extremely fatigued after the surgery, “I was told to expect extreme fatigue up to 24 hours,” Turner told me. “It is mandatory that one takes a cab back the few blocks, or less to the pousada (motel/hotel-like lodging) and keep still and quiet, with meals delivered to the room. For 36 hours, it was like a recumbent (and pain-free) extended period of ‘current’ interlaced with periods of sleep, and dream snippets which in some strange way, seemed to be ‘instructive’ but impossible to recall upon awakening.” The “current,” he explained, is the psychic field generated by up to 100 or more people, all dressed in white garments sitting with arms and legs uncrossed, eyes closed, for periods of three or four hours during the time that Medium Joao, as he prefers to be called, is ‘incorporated’ by one of 35 spirit entities, some of whom are deceased doctors. Turner said while he still has some foot discomfort, he can now walk barefoot and wear shoes, as he chooses. “Grass and sand were uncomfortable to walk upon,” he continued. “Now, to walk on grass is heavenly!” Nor has he required any medication for his diabetic or prostate conditions since the surgery. The only cost for all of that was about $50 for some herb capsules. John of God does not charge. Being a physician, Turner was invited to observe and assist at a “physical surgery,” where, he observed Joao scraping the cornea of a man’s eye with a knife, something not thought to be possible in Western medicine. Moreover, the man was under “spiritual anesthesia” alone. He also observed Joao’s eyes turn different colors. I also had the opportunity just last week to talk to a woman who visited John of God 10 years ago. Her cardiologist gave her only three months to live and said that she would not be able to endure surgery. After visiting John of God, she came back with renewed vigor, underwent the surgery soon thereafter and is still living. Emma Bragdon, Ph.D., a Woodstock,Vermont resident, has been observing John of God for the last 10 years and has led tour groups down there. Her latest book, Spiritism and Mental Health: Practices from Spirit Centers and Spiritist Psychiatric Hospitals in Brazil, provides much information on Spiritistic healing in Brazil, including the Casa. The book has 26 chapters with 30 psychiatrists, psychologists, physicians, and therapists contributing a wealth of information. Among the contributors well known to American readers are Linda Russek, Ph.D., Melvin Morse, M.D., Dean Radin, Ph.D., William Braud, Ph.D., and Stanley Krippner, Ph.D.
“From the Spiritist point of view, after ruling out physical brain damage or disabilities such as retardation, the cause of most mental illness is embedded in the perispirit, also known today as the ‘informational body’ or ‘subtle body,” Bragdon states, mentioning that Brazil has 12,000 Spiritist community centers and 50 Spiritist psychiatric hospitals. .
Almeida explains that mental disturbance can result when “an obsessing spirit exacerbates negative feelings and thoughts in the patient through a kind of telepathy.” This obsessing spirit, he further states, is motivated most of the time by a vengeful feeling against the victim, but the person can choose to accept or reject the obsessing influence. A number of case studies are offered, including one about “Ernesto,” a 32-year-old administrative clerk who attempted suicide after experiencing intense mood changes, aggressiveness, recurrent thoughts of murders and destruction, and self-destructive behavior. After being hospitalized, he became physically aggressive with other patients and was constantly threatening the medical team. He also threatened his mother. He resisted psychoactive drugs, psychosocial assistance and other therapy before electro-convulsive therapy (ECT) was prescribed and also failed. He was then observed by a spiritual guidance team, which consisted of five clairvoyants, two healing mediums, and five who are supportive of the mediums, along with three doctors. The clairvoyants found his energy centers (charkas) to be congested with dark, unruly energies and his brain dominated by a group of “spiritual villains.” Over the next five weeks, Ernesto received magnetic therapy (charka cleansing and energy transmission) and the negative entities were gradually detached from him. He was eventually discharged from the Spiritist hospital and ready to go back to work with continued psycho-social therapeutic support prescribed. In a chapter on integrating spirituality into psychotherapy, Mario Sergio Silveira, Ph.D. tells of the inner turmoil he experienced in attempting to reconcile the Spiritist philosophy he had been indoctrinated with during his youth and what he had learned in university. He attempted to set aside his knowledge of Spiritism so that he could better grasp the major masters of psychology, but, after graduation, found vast holes in his knowledge – holes he was able to fill only by reincorporating his prior knowledge of spiritual influences into his practice. It is very difficult to hear about and read the experiences and observations of so many professionals and not believe there is really something to this whole area of discarnate influence on human behavior and, concomitantly, on mental disorders. It was, of course, observed much earlier by Kardec, Carl Wickland, M.D., Edith Fiore, Ph.D., Louise Ireland-Frey, M.D., and others who had the courage to make their views known. It is disturbing to consider the probable reality of it and realize that mainstream medicine and psychology continue to scoff and sneer at it. Michael Tymn’s latest book The Afterlife Revealed: What Happens After we Die is published by White Crow Books and available from Amazon and all good online book stores.